The Ideate Software team returned to Portland, OR and Boston, MA from the BiLT NA Conference in St. Louis, Missouri. We are still thinking about all the great conversations, presentations, and events that transpired during the conference from August 9 – 11, 2018. Did you visit us at the Ideate Software booth, or did you attend one of our classes? My colleague, Richard Taylor, presented on a topic that continues to plague many Revit users: finding elements that should be visible in views, but for some reason do not! His presentation was appropriately titled “Visibility #$@! Storm with Revit.” As you may be aware, there are over 50 reasons an element may not be visible in a view, and sometimes trying to figure out which one can just drive you insane! If you would like more information, be sure to check out Richard’s BiLT NA blog post. I also presented at BiLT NA this year, and my topic was, “Revit Phasing From A to Z.” This presentation was successful because the topic of phasing serves as a reminder of the importance of coordinating Phasing before modeling anything. 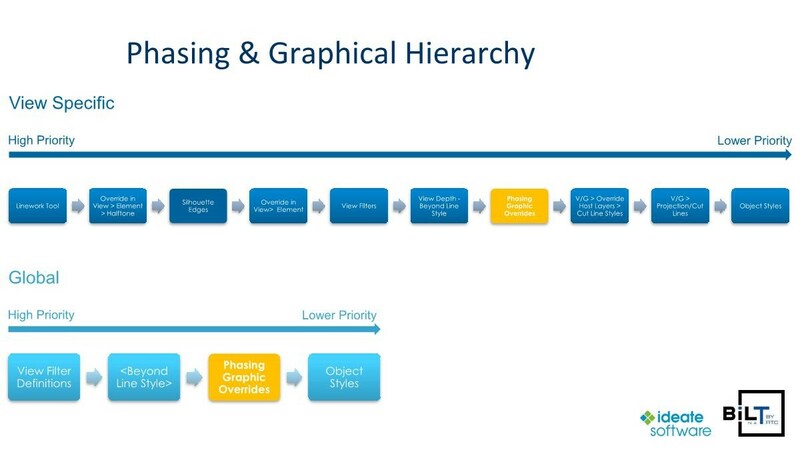 We also took a deep dive into the graphical settings for phasing and hierarchy of where Phasing belongs in Revit’s overall graphical hierarchy. This presentation also served as a reminder as to why we should not create demolition phases. Phasing in Revit touches functionality within our Ideate Software solutions. Watch this video to see how you can create new views with the correct phase settings with our Ideate ViewCreator tool. While Revit Phasing plays an important role in the graphical hierarchy of Revit models, other settings and overrides take precedence over Phasing. This topic was presented to the group as a reminder of how overrides can greatly affect the output of design documentation. Here’s a picture of my session. I always try and have a casual conversation when presenting to the audience. The red arrow is pointing at me. For implementation services or to learn more about how Ideate Software tools can help your business, please contact sales@ideatesoftware.com.